African ChangeMakers Magazine, #RebrandingAfrica – Issue 2, August 2018. 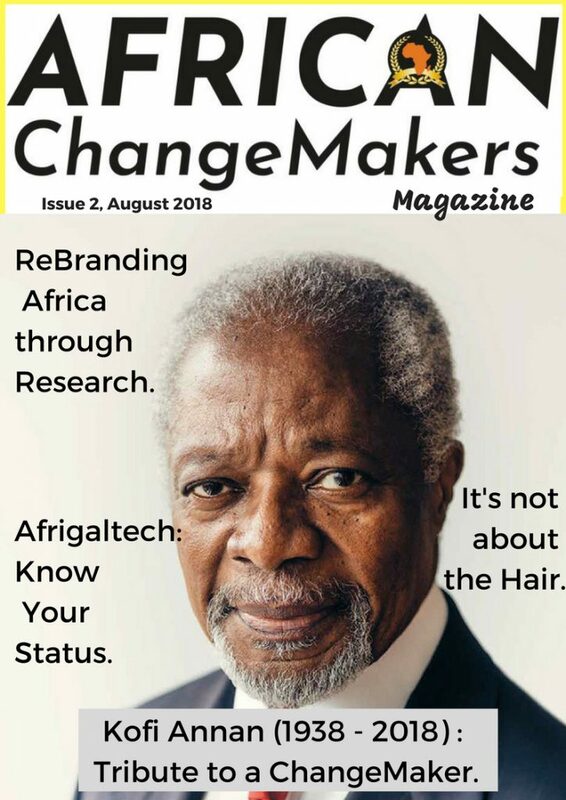 African ChangeMakers Magazine “#RebrandingAfrica” – Issue 2: August 2018. Rebranding Africa is a wake-up call for all African people, leadership, public/private organizations and African Diaspora to see and know that there are opportunities in Africa continent. There was an era when the western world rushed to Africa to empty all her natural resources, human resources, intellect, human dignity and stripe Africa naked of all her natural endowed glory to develop their countries. We are now in a new frontier where developed countries are fighting each other, friendly countries are now becoming new enemies and old enemies are now becoming friend over what they all stole from Africa and the so-called “Dark Continent” as some called Africa is now a destination everyone want to be and belong to. African need to rise up to defend Africa’s sovereignty, re-brand Africa and work in the interest of Africa continent, Africans need to use all available tools, i.e media in projecting the image of the continent. Africa Leaders owe it to it people to make them feel empowered by provide resources and avenues that will nurture such empowered Africans to dream and get innovative for Africa development. An integrated Africa is key to Africa success, we need to all be comparing notes, sharing information to formulate what works best for Africa, speed-up the One-passport program initiative to boost Africa Travel industries, Trade industries, a connected Africa, and free- movement of African people across the continent. Subscribe to FREE African ChangeMakers Magazine & Africa Buzz Newsletter.